What knowledge will the media engineer of the future need to master to meet the needs of his or her employer or clients? As new technologies continue to be developed and content delivery methods evolve, media engineers will need to keep pace to build and maintain the necessary systems these technologies require in the future. But just what technology will the media industry be using in 2021 or 2026? The SBE will seek to acquire the necessary data to answer that question by hosting an Education Summit later this year. The summit will bring together a half-dozen media industry technology thought leaders for one day to discuss the technology in use today and the technology that they predict will be in use over the next five to ten years. The SBE will use the information gathered from the summit to develop a forward-looking document that outlines the competencies of future technical media professionals. From that, the SBE will develop educational content that prepares them to meet the industry’s needs. Costs for the SBE Education Summit are being underwritten by the Ennes Educational Foundation Trust. Formed in 1980, the mission of the Ennes Trust is to provide and support educational opportunities for broadcast engineers through scholarships and educational programs, and provide support for education-related projects of the SBE. The Ennes Trust is supported through donations from members and chapters of the SBE and companies within the broadcast industry. • What will the industry look like in 2019, 2021, 2026? • What skills and knowledge will be needed for new technology? • What skills and knowledge will be needed for legacy technology? The planning group is inviting participants that represent a cross-section of today’s media technology community, bringing together some of our industry’s leading technology thought leaders. They are also determining the date and location of the summit. Watch for updates about the SBE Education Summit in future issues of The Signal. 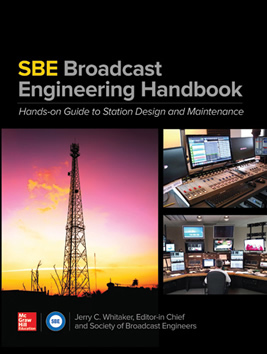 The Society of Broadcast Engineers and McGraw-Hill Education have released the SBE Broadcast Engineering Handbook: Hands-on Guide to Station Design and Maintenance. This new book offers detailed practical information on video, audio and broadcast transmission systems from dozens of the field’s foremost experts. Featuring everything from basic principles and formulae to the latest technologies and engineering trends, this hands-on resource offers practical and up-to-date coverage of all major broadcast technologies for radio, TV and related fields. This webinar aims to foster collaboration between the U.S. Department of Defense and the broadcast community in pursuit of establishing coordination procedures and operational harmony. On Saturday, April 16 at 8 a.m. at the Las Vegas Convention Center in room S219, the SBE’s annual Ennes Workshop educational program at the NAB Show takes flight for the 21st time. Attendance requires a full NAB convention registration (available at a discount to SBE members) or either a PBS Techcon or NPR APRE registration and badge. The Ennes Workshop at the NAB Show has always addressed what broadcast engineers most needed to know to be successful. The presenters are the best teachers, recruited specifically to address the topics at hand. The 2015 Workshop was so popular, an additional room was opened to handle the crowd overflow. Following is a rundown of the day’s topics and presentations. Introducing the day’s program; a high level view of how an ATSC 3.0 TV station will be different from today’s ATSC 1.0 station and the fundamental architecture of the next generation in broadcasting. 8:35 a.m. – 9:10 a.m.
An overview of Audio for ATSC 3.0, describing its immersive and personalizable elements. 9:10 a.m. – 9:25 a.m.
9:25 a.m. – 9:50 a.m.
ATSC 3.0 PHY introduces many new technological features such as two-dimensional non-uniform constellations, improved and ultra-robust LDPCs, a novel frequency pre-distortion MISO antenna scheme and many others. It has extensible signaling to allow technology evolution within the physical layer in the future without breaking previous ATSC 3.0 PHY operation. Furthermore, it provides great flexibility in terms of configuration, and as a consequence the tradeoff of coverage area vs. configuration settings needs to be understood. Use cases of ATSC 3.0 will direct configuration settings to be set for certain expected channel conditions and various examples will show new coverage areas possible with the ATSC 3.0 PHY Layer. Presenter: Luke Fay; Senior Staff SW Systems Engineer; Sony Electronics, Inc.
An amazingly complete video production system that not so long ago required a semi-tractor trailer is now a carry-on. We asked Paul, following an article inStreaming Magazine, to come to the NAB Show and demonstrate. 10:10 a.m. – 10:45 a.m. The ATSC 3.0 standard encompasses a large variety of broadcast technologies beyond the standard linear model provided by the original DTV standard: ATSC 1.0. While broadcasters will be able to deliver much higher quality linear digital television, the new standard also supports non-real-time (NRT) data delivery, an interactive runtime platform, companion screen support, automatic content recognition, personalization, and usage metrics. These new services are delivered using an underlying set of IP protocols over “pipes” within the broadcast frequencies or over broadband forming a hybrid delivery environment. 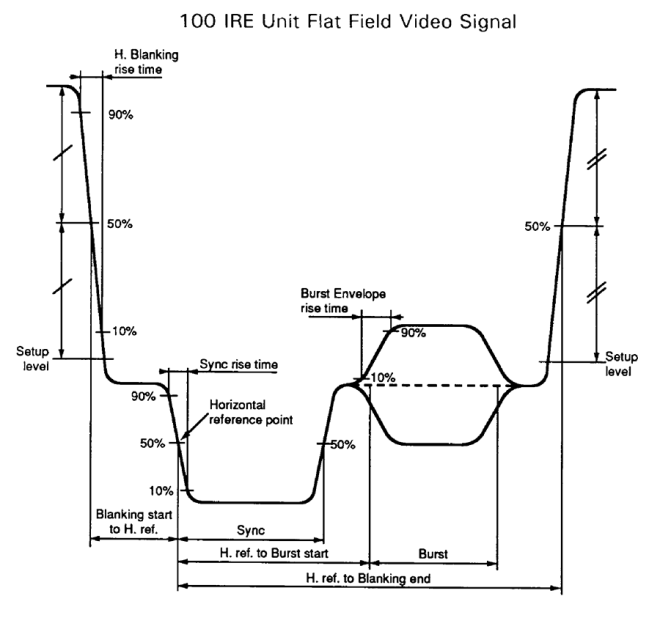 The broadcast “pipes” (PLPs) can simultaneously deliver the broadcast content at different bit rates and robustness. All of this capability must be communicated to receivers in a way that allows efficient selection and decoding. The ATSC 3.0 delivery standard, A/331, includes signaling which prescribes a way to locate and tune to the services currently being broadcast and simultaneously provided over the Internet. The announcement standard, A/332, provides a mechanism to describe the upcoming programming event schedule. These standards encompass the core facilities for transmitting data and metadata that allow receivers to tune to the ATSC 3.0 services, including interactive applications and data, and provide a rich environment for discovery and promotion of upcoming programming. This talk will focus on the details of the signaling and announcement standards specifically the organization of the data structures, their interrelations and how they are expected to be used by receivers. The signaling and announcement data structures can be delivered simultaneously over broadband and broadcast so a description of how this is specified will also be covered. Implementation examples will be shown for how the signaling and announcement information could be used by an interactive receiver environment. As the next generation of digital broadcast television known as ATSC 3.0 develops, one of the key features and application specified in the requirement for the system is Advanced Emergency Alerting (AEA). AEA will provide the public with alerting capabilities that are far beyond the EAS and WEA systems. AEA will not only support and deliver governmental provided alerts, it will allow stations to provide critical supporting information and even originate alerts when the station’s news and weather resources can provide critical and timely information on impending situations that could cost lives. This presentation will look at the system requirements along with the solutions and capabilities that are emerging in the ATSC 3.0 development process. Examples of the alerting content as displayed on receiving devices will be shown as well as a look at the information workflow that will take place within the system and television station. The ATSC 3.0 transmission system fundamentally is based on the use of Internet Protocol (IP) methods and data structures for delivery of content to consumer receivers. To facilitate that delivery, new infrastructure will be required to support aggregation of the data carrying the content and its transport to one or more transmitters. Most of the new infrastructure itself likely will be based on use of IP techniques. One significant portion of the new infrastructure will be the segment extending from the output of the Transport Layer to the input of the transmitter(s), encompassing formation of ATSC 3.0 Link-layer Protocol (ALP) packets and operation of the Studio-to-Transmitter Link (STL). In designing the new ATSC 3.0 STL system, it was necessary to make provision for Single-Frequency Network (SFN) operation of multiple transmitters and to document provisions for practical transmitter operations in both single-transmitter and SFN configurations. The new ATSC 3.0 IP STL sub-system will be described in its various aspects along with considerations for SFN operation. 2:25 p.m. – 2:55 p.m. Believe it or not and as painful as the shift to HD appeared, it was a perfect storm where several technologies lined up for program suppliers, new distribution methods and consumers. This specifically being file based workflows, 16×9 aspect ratio, digital distribution, flat screen TVs and surround sound. By contrast, UHD’s improved resolution does not present the same kind of visual improvement for consumers with sub 55-inch screens at normal viewing distances. Consumers generally consider more pixels as an upsell feature only. The real UHD benefits of high dynamic range, wider color gamut and higher framerates allow the industry to break free of many of the legacy parameters designed initially for tube displays at the expense of compatibility. This makes UHD a real game changer that will likely be more disruptive than the switch to HD. This session will put all the UHDTV issues on the table to help inform your direction as ATSC 3.0 makes UHDTV a reality. 2:55 p.m. – 3:25 p.m.
A smart phone is a very capable RF platform that can be configured not only for data and phone calls, but in some cases FM radio and UHF television. Most of what a smart phone is, is software defined and limited by the hardware. There is also a carrier component. What your carrier will support and allow is a big part of what your cell phone can do. ATSC 3.0 supports mobile viewing either via the over-the-air transmission path or through a WiFi gateway. Knowing the basics of how your cell phone works will help you understand what is possible and practical. 3:25 p.m. – 3:55 p.m. There is much debate in the broadcast industry on the future of terrestrial radio transmission. AM service is widely recognized to be struggling and some countries are working on replacing FM with DAB transmission in band III. While HD Radio deployment combined with the FM service is gaining momentum there are no concrete plans for full digitization of the FM band. No matter the technology, while operating in an analog/digital simulcast environment the broadcaster bears the highest transmission cost. This session will show that only when the end goal of pure digital transmission is reached can we achieve lowest transmission costs and best spectral efficiency. Now imagine turning 30 analog FM stations to 300 digital HD Radio stations within the existing FM band. Extending the FM band to include TV channel 5 and 6 can provide yet another 200 audio services; plenty of capacity to revitalize the AM service with shared translators on a digital carrier. Today, many radio receivers can tune to the top end of TV channel 6 and many chipsets have support for the entire extended FM band. With digital HD Radio transmission it is also possible to provide ancillary audio service to a TV station with minimal impact to the ATSC signal. A single transmitter can broadcast 15 or more audio services along with data services; ideal for cultural and ethnically diverse content in urban markets or more audio services in rural markets. What about crowd sourcing 15 different music genres and making radio an interactive experience? With increased data capacity can we carry TV based immersive audio over to radio? Is it time to make surround sound work in cars? Artist experience and traffic services are already well established. Let’s build out graphical data services over HD Radio. What about graphical sport updates and adverts? What about advertising campaigns delivering coupons to listeners via QR codes captured on a smartphone? What about periodic traffic camera updates in your car? This session will paint a vision of a true multimedia radio experience that is only achievable once we embrace all digital terrestrial radio broadcasting. The best part is that this future is available now as we can demonstrate this system working with over 30 million HD Radio receivers in the field and shipping now in most automobile models. 3:55 p.m. – 4:30 p.m.
Television Networks from ABC to XYZ are experimenting (or more) with IT-based Channel Origination, including Live Integration, in all-IP datacenter environments. These environments include local and hosted “cloud” technologies and practices, a long way from green tweakers and black burst. This talk explores the early lessons and design approaches of several early adopters of these data-centric television technologies. Many broadcast and media organizations are pursuing commercial operation approval by the FAA of Unmanned Aircraft Systems (UAS) for news gathering. Navigating the training, procedures and proper application with the FAA for waiver under Section 333 can be very involved. The disciplines are similar in scope to other regulations and safety procedures with TV helicopter operations; however, these aircraft are unmanned. This session will give an overview of how to get involved with an FAA Designated UAS Test Site, assigning a designated UAS Operations Manager, implementing a UAS flight program, training Pilots and Visual Observers. The current status of FAA requirements for UAS Pilot certification will be reviewed. “Safety First” is the goal and initiating flight procedures with your Risk Management teams is imperative. The Ennes Educational Foundation Trust has awarded four scholarships for 2015. Winners were chosen from applications received by July 1, 2015, from the previous 12 months. The Harold E. Ennes Scholarship, Robert D. Greenberg Scholarship and John H. Battison Founder’s Scholarship are awarded to individuals interested in continuing or beginning their education in broadcast engineering and technology. The Youth Scholarship is specifically for a graduating high school senior interested in broadcast engineering as a career. Each scholarship awarded this year is for $1,500. This year the Harold E. Ennes Scholarship recipient is John Pooley from Boston. Pooley is a student at Emerson College in Boston studying studio television production with a focus on broadcast engineering. He would like to work as a news photographer/editor/engineer and has experience in news, live event, and corporate video production. John is also an Eagle Scout, a Certified Archery Coach, and a shodan black belt. Receiving the Robert Greenberg Scholarship is Clifford White from Tyler, TX. During the summer of 2015, White worked as a broadcast engineer at Radio Esperanza in the Rio Grande Valley of Texas. He now does freelance radio broadcast engineering work while studying electrical engineering at LeTourneau University in Longview, TX. The John H. Battison Founder’s Scholarship has been awarded to Patrick Wright of Madison, WI. Wright is currently enrolled the Illinois Institute of Technology in Bronzeville, IL, and studying computer engineering. His broadcast engineering experience includes work for Newsweb Radio Corporation and WLS. He currently works part-time at WCPT-AM/FM. Elaine Phillips received the Youth Scholarship. She is a freshman at the Massachusetts Institute of Technology. She previously attended Harvard Extension School. Legally blind, she aspires to use technology to enrich lives, especially for disabled people. She is interested in studying electrical engineering to make TV broadcasts more accessible to the blind. The Society of Broadcast Engineers is the professional organization of television and radio engineers and those in related fields. The SBE has more than 5,100 members in 114 chapters across the United States and in Hong Kong. There are also members in more than 30 other countries. Most chapters meet monthly and offer educational programs and an opportunity to network with other engineers. The SBE offers the largest and most recognized certification program for broadcast engineers, operators and technicians, with more than 4,500 certifications currently active. The Harold Ennes Scholarship Fund Trust was initiated by Indianapolis Chapter 25 in 1980 in memory of Harold E. Ennes, author of many textbooks for broadcast and broadcast-related communications training and a member of the Indianapolis chapter. Ennes was a member of the SBE’s national Certification Committee and made many contributions to the early development of the Certification Program. To encourage greater growth, the Scholarship Trust was transferred by Chapter 25 to the SBE national organization to administer in 1981. The name of the Trust was changed in 1995 to the “Harold Ennes Educational Foundation Trust” to fully embrace its expanded role. FEMA, working with state broadcast associations in Connecticut, Maine, Massachusetts, New Hampshire, Rhode Island, and Vermont is planning to conduct a New England regional IPAWS test in September. This test will be a follow-up to the tests conducted in West Virginia last September, which resulted in 90% of participating stations successfully carrying the National Periodic Test EAS code and second test involving participants in Ohio, Kentucky, Michigan and Tennessee, conducted on March 18, 2015, which met with similar success. FEMA is conducting a series of regional tests in preparation for a future nationwide IPAWS test. The goal of these preliminary tests is to evaluate how messages are distributed and propagated throughout the system, and identify areas for improvement. The next regional test, which will involve participants in Connecticut, Maine, Massachusetts, New Hampshire, Rhode Island, and Vermont, will be conducted on Sept. 16, 2015, at 2:20 p.m. Eastern Time. Local radio and television stations are not required to participate in the test; however, broad participation by stations will be very helpful in evaluating how the test messages propagate throughout the region. In preparation for the test, FEMA is hosting technical webinars on Aug. 19 at 2 p.m. Eastern and Sept. 3 at 10 a.m. Eastern. The webinars will outline how the Sept. 16 test will be conducted, and will also provide information regarding EAS device configuration in preparation for the test. The technical webinars will discuss the technical side of IPAWS and conclude with step-by-step instructions for configuring various EAS devices. The two tech webinars will be essentially identical. The webinars will be recorded and available for later viewing as well. The webinars are open to all but will specifically address the New England test. FEMA will conduct additional webinars in support of future tests in other areas of the country.